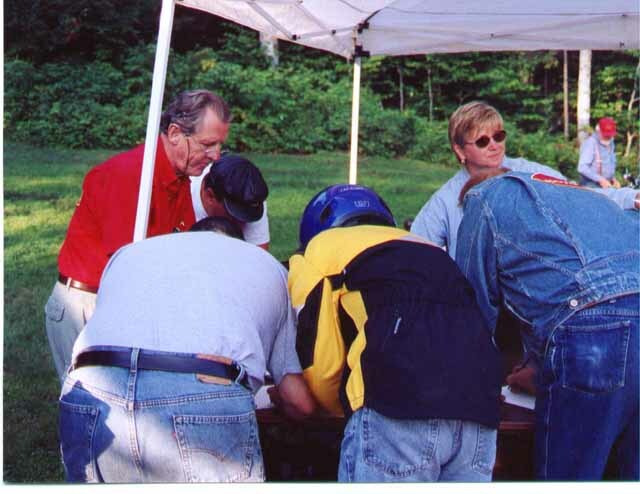 This year, the 2002 Moto Guzzi National Owners Club Annual Rally was held, August 8th - 11th in Paul Smiths, New York on the grounds of Paul Smith's College. The $50 rally fee included camping at the Alumni campgrounds lakeside and meals. These annual rallies always have participants from all over the country and from overseas. A small rally compared to other brands, it has always been the largest gathering of Moto Guzzis in one spot. Guzziphiles have used the annual rally as an excuse to go to different parts of the country as it alternates between East Coast, West Coast, and the Midwest. Paul Smiths is located at the intersection state Rt. 30 and 86 in the Adirondack region of upstate New York. 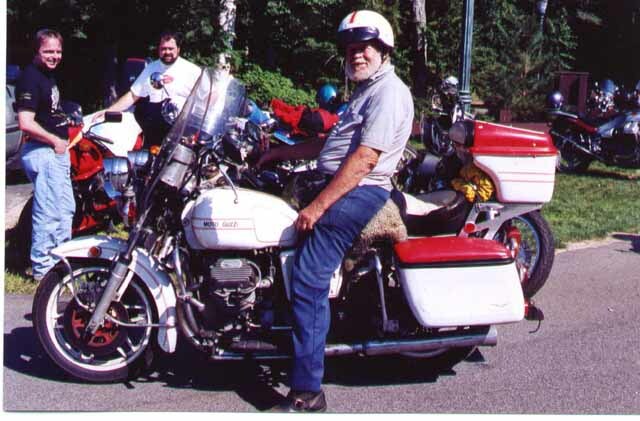 Located near Lake Placid and Saranac Lake, it is an ideal location for a motorcycle rally. 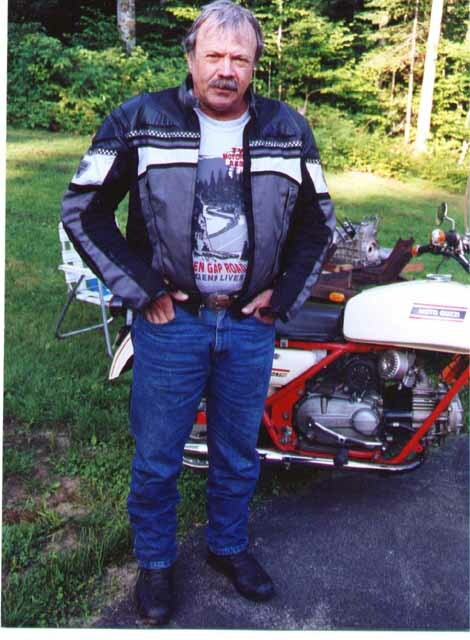 The Adirondack area is a great place to ride. Large tracts of land are designated as wilderness areas. The translation for one with a motorcycle means a huge amusement park to ride in, good pavement with big sweepers and no cops with the exception seeing some in a couple of towns. With some encouragement from my wife, I was kicked out of the house for a vacation. She said that I needed to take a trip. It must have shown. 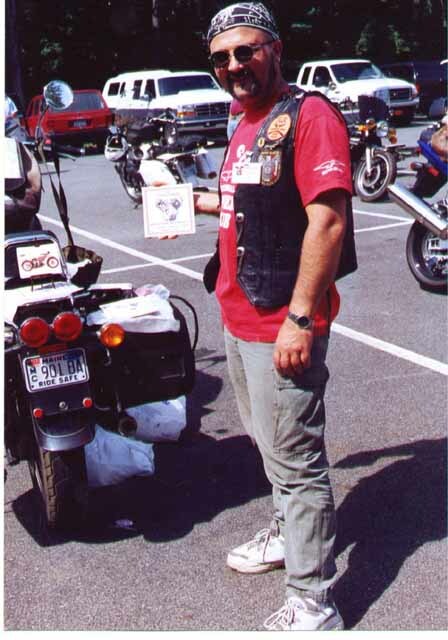 From the club newsletters, I knew about the Annual MGNOC rally being held in upstate New York, and I had not seen my friends in the East Village for some time. It looked like it was time for another island to island trip, the big island of Hawaii to the congested island of Manhattan. Two long flights on the "Friendly skies", a bus trip from Newark International Airport, and a taxicab ride from Grand Central station to the East Village, I was ringing the doorbell at my friend's home. I was staying with Mike and Nuri Wernick, owner of the Rising Wolf motorcycle parking garage. They were also letting me use their Honda CBR600F2. After a week of tune up rides in New York City, playing road warrior and short ventures into the adjacent Jersey countryside, I was ready to go north. I took the Palisade Parkway out of the New York City area and connected with I-87 going north. The bike was able to handle the type of riding I like to do, cruising at sub-sonic speeds of 70+ mph and still having the power to accelerate me out of tight spots. With the exception of a Ford SUV trying to rearrange my face with his right rear quarter panel, I had an uneventful trip up to Lake George on the interstate. This short jaunt on the interstate got the throttle fever out of me. I hadn't been off the island in a while and it felt good. The smile was coming back to me. I headed north on 9N out of Lake George. Mike was right. He said that once I left the Lake George area, I would have the road to myself. Wow! A great motorcycle to ride, a full tank of gas, no deadlines to meet, an open road in front of me, and no traffic! Twist my arm! In Keene I picked up Highway 73 going west. I was looking for this barbecue place that Mike told me about, with no luck. I don't normally eat when riding long distances. Just water, an occasional soda every hour, stretching the legs and a pit stop for gas and other pilot duties. No food! The digestive process and saddle time make me more tired. Towards the end of the day I want to eat and it's my reward for being a road surfer on a motorcycle. Anyway, on route 86 between Lake Placid and Saranac Lake in the sunset light, I almost hit this guy in the middle of the road. It turned out that the Tail-o-the Pup restaurant has someone directing traffic because of the amount of business that they do. The joint was busy. This had been my secondary destination for the day and I had found it by luck. People everywhere and bikes all over. The outside dining patio was crowded and the temperature was getting cooler. Large outside propane heaters were on and I didn't feel too out of place when I kept my leather jacket on. Sometimes, I think it can be the fish out of water routine with me. Thin blood and being from an island in the middle of the Pacific, the weather can feel cooler to me than other people, I wasn't wrong when I saw other people grabbing their jackets and sweat shirts. I ordered a full slab baby back rib dinner, a pint of Lake Saranac Pale Ale, and water from a pretty blonde waitress. The meal, the beer, and the service were excellent. The only thing missing from the meal was my dessert of another beer and a cigar, but not being at my final destination and having more miles to put on, I also didn't want to have to play dodge with Santa's sleigh crew on summer leave frolicking in the north woods. I blocked the idea of another beer from taking hold. 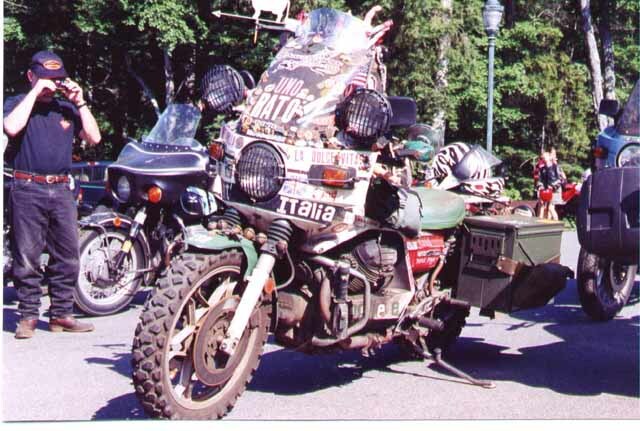 After I had gotten some information from some Guzzi riders about the rally site, I took off. I buzzed the college campus after not seeing the sign to the rally site. I went left instead of going right, So much for dead reckoning and the internal compass. Without the sun and being very dark in the upstate New York woods, I lost my bearings real easy. It happened to me in Munich on one motorcycle trip. I went around in circles for hours, come to find out that the Munich homeboys have the same problem. It seems that the streets are laid out in a weird pattern that they don't understand either. Being the only thing moving on campus, I got the feeling that I was in the wrong place, I turned around and made my escape. I didn't see any flashing red lights or peasants with pitchforks chasing me. No harm, no foul, and no other motorcycles in sight, I retraced my path and went right instead of left this time found a sign and a little later the campground entrance. Within a hundred yards of the main road was the beer tent. Seemed like a good spot to put the kickstand down and get my bearings. One thing. I noticed right away after entering the campground ... Sand! The dirt road in this campground consisted of sand; loose, medium and hard. Okay, maybe it could be a test or a joke! The small crowd at the beer tent assured me that the rest of the campgrounds was exactly as I saw it. Wooded lakeside camping area with sandy soil as its base. Patches of grass and blueberry bushes all over. The evening activity consisted of meeting people, talking and drinking beer, plus setting up your tent in total darkness. Friday was the official first day of the rally with people coming in and signing up at the registration desk. There was the sign-in desk tent with a number of 2002 Moto Guzzi motorcycles along side of it. Moto Guzzi North America was behind them .... looked like demo rides. After I registered for the rally I went over to the Sport Cycles tent. 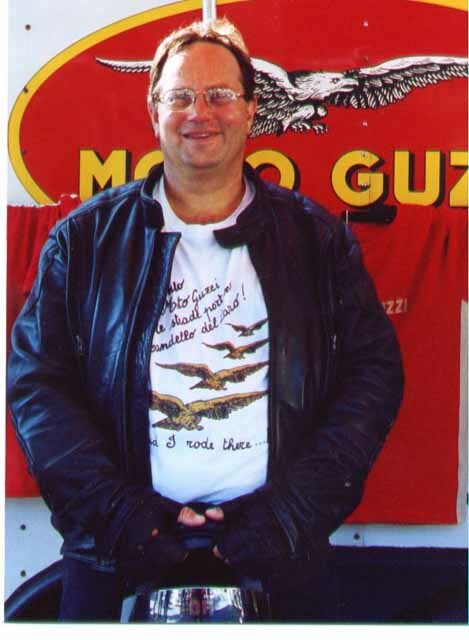 The Moto Guzzi dealer from Avon, New York, had set up a regular shop minus the bikes. Parts and repairs could be purchased. I saw a number of bikes getting repairs and work done. This was handy if your bike needed some last minute work. The rest of the day was spent exploring the Saranac Lake area on a short ride to see what I missed the day before. Nice area, nice town. I dropped in at the local Legion Post for a drink and chit chat with the locals. They invited me to a pig roast the next day. I headed back to the college for dinner. When I got in, I noticed the parking lot that the rally site was using was starting to get filled with Moto Guzzi bikes. Dinner was okay to good depending on what you ate. Sodexho, the college caterers was contracted to do the meals. Cafeteria style, so that you can try to please the most people at one time. Night time activities included more of the same, plus it included watching people fall down with their bikes going up and down the sand hill to the lake. No injuries or damage, but entertainment in the campgrounds. I also reconnected with some friends that I had previously met in Hawaii. They work for Boeing and had come in to test the Boeing 777 before it went into production. Saturday started a little slow for me. I think the beer slowed me down .... duh! I hustled over to the dining hall aka the gym for breakfast with the intention of eating, then showering. I got there five minutes late and the doors were locked. The cashier looked up after I knocked on the door and gave me the thumbs down. Oh, well, no breakfast ... snivel. I decided to take a shower. While I got my shower gear off the bike, I noticed the Moto Guzzi North America people over at the registration tent. With my usual powers of observation, one of the guy's had a number of papers in his hand. It seemed that as I got closer, I heard "Demo rides and you do this and you do that.'' They were in the midst of setting up the demo rides. The group broke up and I asked if could sign up. I was able to sign up for the V11 LeMans and the Stone. I didn't want to get too greedy with hogging the time slots. It looked like that was the silver lining to the dark cloud of not having breakfast. The silver lining got more silver as I purchased a battery tender and a set of mufflers for $40. Both were used, but in good shape, almost new. There's always someone at these smaller rallies to unload items from their garage at bargain prices. I scored again! After I was done with the demo rides, I headed down towards Inlet, New York. I was looking for Cristy's Red Dog Tavern and their Wings of Fire. Their Wings of Fire made with Armageddon hot sauce, and can have flames shooting out your body, great for cold weather! With the destination of the day in mind, I motored south on route 30, surfing the Adirondack roads. Thoughts of the demo rides entertained me while I compared them to the CBR600F2 that I was riding. I had test rode a 2002 red LeMans and a 2002 fiat eggshell white Stone, both good bikes no matter how they were ridden. In short, the LeMans would be a fine sport touring mount for someone that would like something different. The Stone would be for the "no frills, back to basics" type of person. A cruiser style of bike that could do highway duty with no problems. Since I have both types of bikes in my stable, either bike would have been entertainment for me. Compared to a CBR600 4 cylinder Honda .... just different. I went past Tupper Lake and leaned right, route 28 West took me into Inlet. New York, a nice tourist town by the lake, small and no police around. I found Christy's Red Dog Tavern. Frankly I wasn't hungry, but being a fan of their hot sauce, I had to go in. Their Armageddon sauce made from Habanero peppers kept me going on a motorcycle through the snow covered passes in the European Alps more than once. It would be like a trip to Hawaii and no pineapple eaten. After I looked at the menu, I decided that I wasn't that hungry for an order of 12 wings of Fire-the Buffalo wings soaked in the hot sauce. I ordered the salad and garlic bread plus beer and water instead. I dumped Armageddon sauce on the salad and in the salsa for the garlic bread, the waitress looked at me and remarked that she had "never seen that before. I should have just ordered the wings with the beer and water, both were good, but the combination was too much food. A snapshot of the place and I was back on the road back to the rally site. I wanted to get back to Saranac Lake for the pig roast at the American Legion. Too far south and too much road back to the rally site, but still a lot of fun on a motorcycle! I missed the pig roast. I was however in time for dinner "on campus" and that would have to take its place. Same time and same fare. The parking lot was full of Moto Guzzi bikes and as I cooled my heels before the announcement of the People's Choice, I walked around to look at the assortment of bikes. It looked like more than 250 Moto Guzzis and a smattering of other bikes. A blue Eldorado with whitewall tires won the People's Choice. It was a nice bike, but not a stock color and too much blue on just about everything that could be painted blue. A slide show with ex-racer Michele Duff followed in the parking lot, a poor man's drive in movie. I preferred to do my drinking in the campgrounds, others were in the mood to hit the night spots. Riding in Bambi country at night swayed a lot of people from a fling down the highway to town. I did notice even though there were a number of campfires, you were still able to see the stars. Things are done differently near the Canadian border! I went back to the beer tent and asked for a hotdog to go along with the beer I was drinking. As I stood there and chatted with other Guzzists, I noticed the kid that was cooking. Must have been a North Woods camping thing. There was a complete neglect of basic food handling sanitation. The young gentleman of junior high vintage was scratching his nose and handled the money, hotdog, the cheese and bun with bare hands. Cooking utensils were right in plain view and no effort made to use them. In the middle of this process, his father came over to check on things. He also handled the food with bare hands. No effort was made to use the barbecue tools either. After I took ownership of the questionable dawg, I decided that I should say something to the dad about kitchen sanitation. While I was attempting to explain to the father about what happened, his wife came up and said, "What do you expect? We're camping!" I retreated after that explanation and made a mental note to turn down any invitations for their house. I just didn't feel that it would be right to share germs without a proper introduction. Fortunately, I have a strong constitution and use a lot of hot sauce when I eat, plus the beer probably killed some of the gems, at least I'd like to think so. Sunday morning came early enough. The eyeballs were in rebellion and did their best not to cooperate and open, but I wanted to make it to the dining hall for breakfast. As I passed the demo bikes, I noticed that they were still assembled for a ride. It turned out that they were still doing demo rides albeit with a smaller crowd. I restrained myself, ate breakfast and headed back to the campsite. I had to get back to the city and wanted to "get out of Dodge" like everyone else. After a number of quick good byes and bungee cords all over the bike to secure the load, I headed out of camp and took the back roads towards New York City. I had a weird noise coming from somewhere on the lower end of the bike and didn't want to do another episode of "road shark-the highway predator" on I-75 South. Just in case something should happen, one lane of traffic on my backside sounded a lot better than three lanes of traffic and the thought of being a human hockey puck did not appeal to me. Most of the ride back south was hot and pretty uneventful with the exception of a bee that tried to use my lower left lip as a dart board. Luckily I came across a grocery store that had a pharmacy. I needed some anti-histamines before the lip swelled up to the size of golf ball. This incident also reminded me of what I had forgotten to pack. Flashlight, map, pocketknife, sunscreen, towel, soap, tooth blush, toothpaste, band-aids, tools, credit card, money, passport, etc., etc., and etc.. Well, this time I had forgotten the drugs. On this ride to a rally, two things worked in my favor, this time. You don't have to cover long distances to get to a town or store and I only swell up where I'm stung, but don't end up having a problem with breathing. In the western states, you really need to plan to travel a distance for services of any type. I stopped to see a college buddy in Highland Park and got lost in the Woodstock area. The sunset left a hot glow on my right cheek as I got closer to the Palisade Parkway. I ignored a couple of Jerseyite rednecks in a black pickup that gave me a nasty salute.. I waved back at them in the sign language that they decided to communicate in. I guess they were welcoming me back to civilization. The rest of the way to the East Village was typical of Sunday evening traffic. Road warrior again. Traffic was backed up the FDR. and I took the 135th Street exit into Harlem. Like the force on the Hudson, I kept on going south towards East Village. It look about 12 hours, I was back at the Rising Wolf Garage on 9th Street, tired, dehydrated, and a little sunburned. I noticed that my face was starting to hurt from the grin plastered across it! MGNOC Staff Writer - Luigi Riva, Brignano Gero D' Adda, Italy. Denis Pelletier, Charlotte, North Carolina. See early 1970's 500cc Moto Guzzi Falcone in background. Signing up for demo rides, provided by 'Moto Guzzi North America'. On the left is the President of MGNA, Alex di Bagno and Brenda, MGNA employee to the right. Hi Brenda! B.J. Schwartz all the way from Hesperia, California. 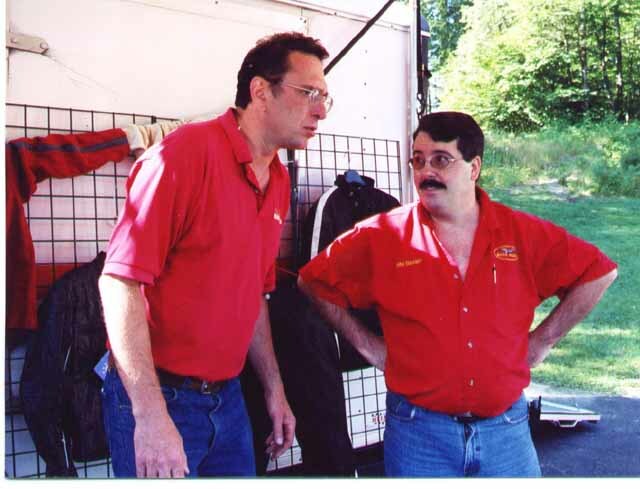 Keith Smith (left), rally organizer, and John Stoddart (bigtime MGNA guy). 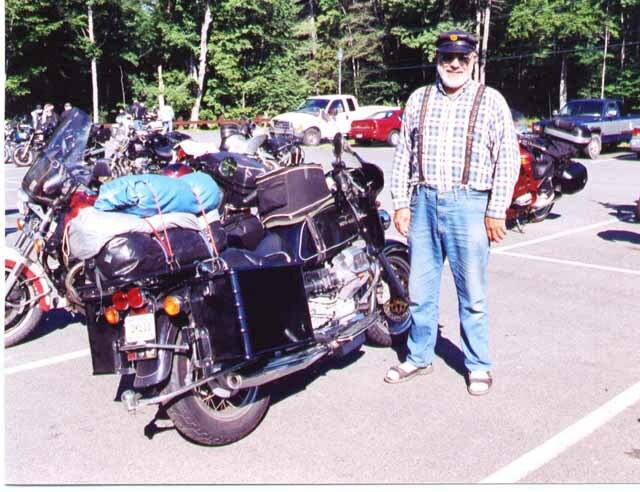 Francis Bouchard, longtime MGNOC member from Mechanicville, New York, standing next to Frank Wedge's '98 EV.